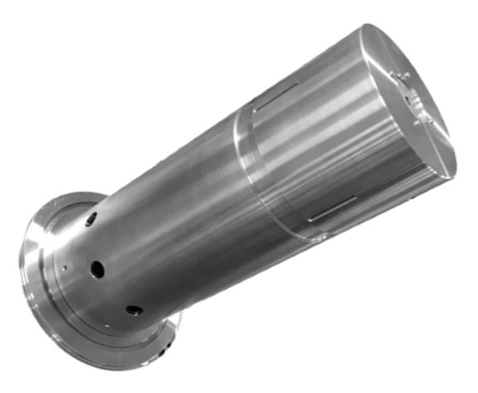 IE-gun is our single cavity ECR source module for plug & play high energy ion or electron beams. 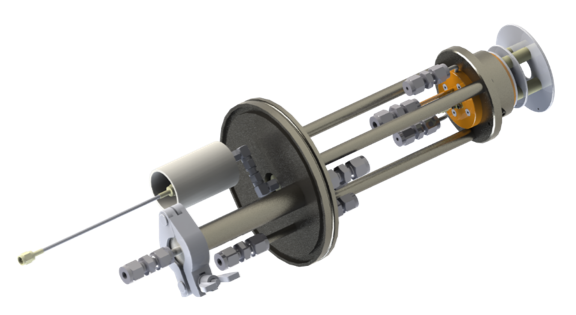 It can be configured up to 50kV, and mounted on any vacuum system with a 160mm (<30kV: 100mm) CF or LF flange and adequate pumping speed. Just plug it in, no high voltage platform required. For other types of ECR sources, check out our products page. The beams are generated by a patented mini ECR source (COMIC) and extracted with a double gap system that allows you to adapt the beam shape (convergent, parallel or divergent). You can find more about the technology here. The extracted current can be tuned with three parameters: the Ultra High Frequency (UHF) power, the source gas pressure, and the electrical field strength at the ECR cavity exit (determined by the focus voltage relative to the beam voltage). The source comes with a user-friendly control & monitoring interface, that allows you to tune the beam, record data, and run stored recipes. Labview drivers are available to integrate our software with other systems. 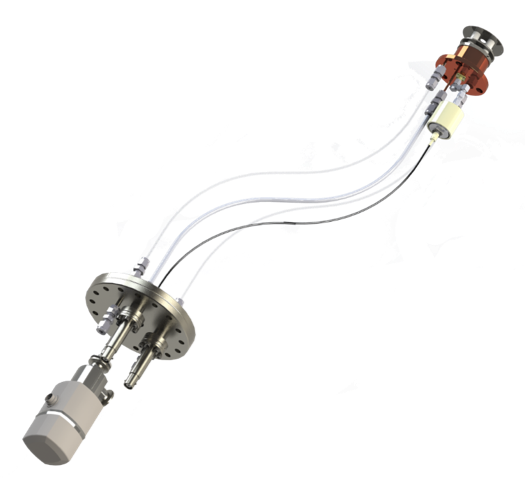 For free positioning of a source within a given vacuum system, we also offer a flexible version, without the rigid supports. Mount it anywhere you want with a vacuum compatible insulating support that holds the source body. 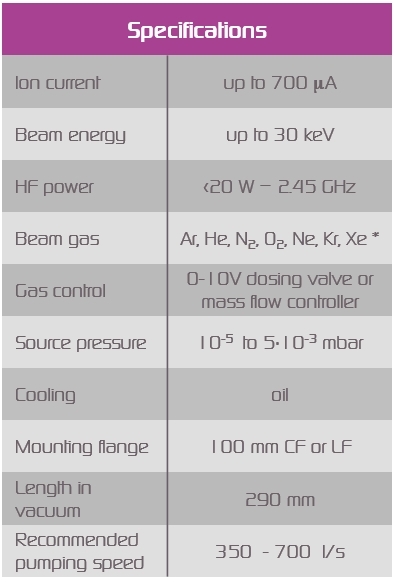 This might be of interest for applications in which the source has to move with respect the sample (such as Ion Beam Figuring (IBF)) or for applications in which the system poses constraints as to where the source module can be mounted on the system and where the beam needs to be. If you already have a HV-platform in place, our HV-platform compatible version may be more adequate. In this adaptation the source is no longer electrically isolated from the mounting flange. As a consequence the distance between source and flange can be shortened. 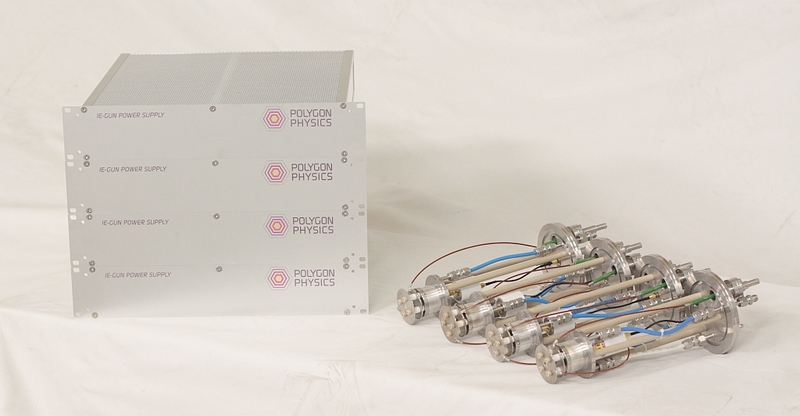 Put together your own custom ion beam deposition system for multi-component thin films. Homogeneous thin films can be obtained using multiple ion sources in a confocal geometry. Each source sputters its own target. Targets can be anything from hand-cut pieces of metal foil to sintered pellets. 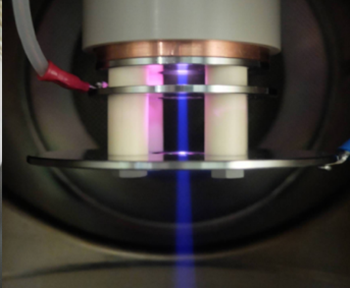 Ion beam sputter deposition of amorphous silicon and oxide thin films, aiming for coatings with low optical absorption and mechanical loss for better gravitational wave detectors. The favorable film characteristics were ascribed to the deposition characteristics and cleanliness of our source. You can read more about it here. 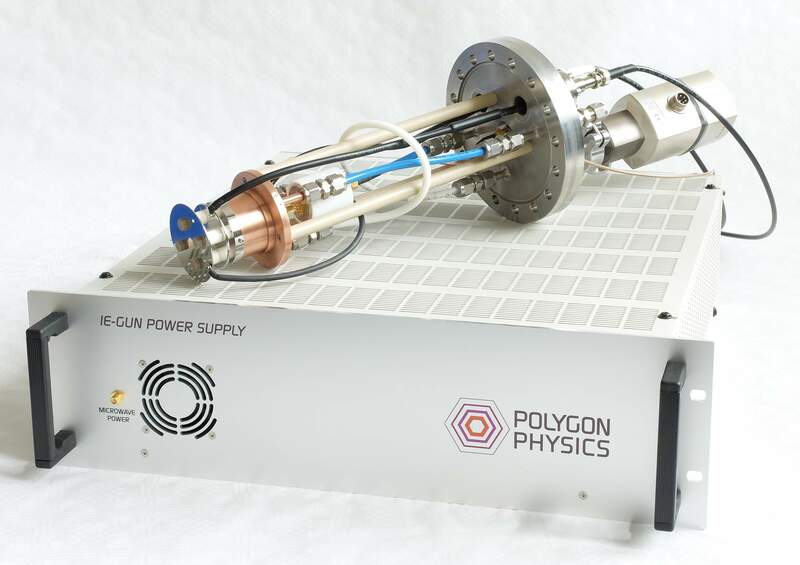 IE-gun as ionization source and injector for an electrostatic accelerator, to study the cooling dynamics of polycyclic aromatic hydrocarbon molecules (PAHs). PAHs are considered as possible carriers of characteristic infrared emission bands in the interstellar medium. 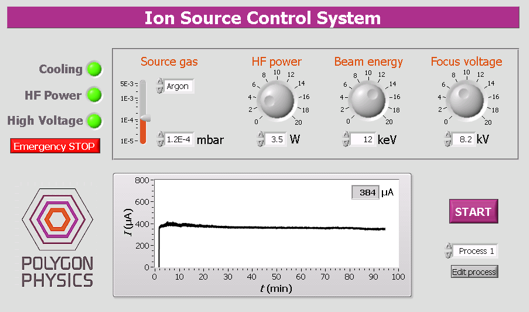 For this application the interest for our source was sparked by its ability to ionize the gas molecules without breaking them up (‘soft ionization’).